In the spring of 1665, Gian Lorenzo Bernini arrived in Paris having been summoned by the court of Louis XIV. The Louvre was to be remodeled so as to better reflect the magnificence of Louis le Grand, and the great Italian master was just the man they needed for the job. Painter, poet, architect, and sculptor, Bernini had long since proved his worth in his native land, leaving his mark especially in Rome, where he worked for a succession of seventeenth-century popes to help create the baroque capital we know today. His time in Paris would be frustrating in the extreme. Bernini did not get along well with First Minister Colbert. Bernini was an artist, Colbert, a politician. They clashed right from the beginning over the specifications for the upcoming project. Colbert fretted over the practical details: sewers and traffic patterns, security and climate. Bernini, ever the purist, focused on aesthetics – in this case, Italian aesthetics. Their collaboration did not last past the fall. Bernini returned home in October. His plans for the Louvre were not accepted. During his stay in Paris, however, Bernini did have another project to occupy his time. Starting in June and armed with chisel and auger, Bernini transformed a piece of fragile marble into a likeness of King Louis. They had met for the first time in early June and sat together a dozen or so times to allow the Italian sculptor to reproduce the minutest details of the royal visage. Sometimes those details took the King by surprise: Did he really have a crooked nose? Was it necessary to show the wart on his face? Compromises were made and the bust took shape. When the sculpture was done, it was displayed at the Louvre, then at the Tuileries, then in the salon de Diane at the Palace of Versailles where it remains to this day. If you haven’t the time to go to Versailles to see the original, come to Québec City to see the replica. Louis reigns regal over his Place royale in the Lower Town. 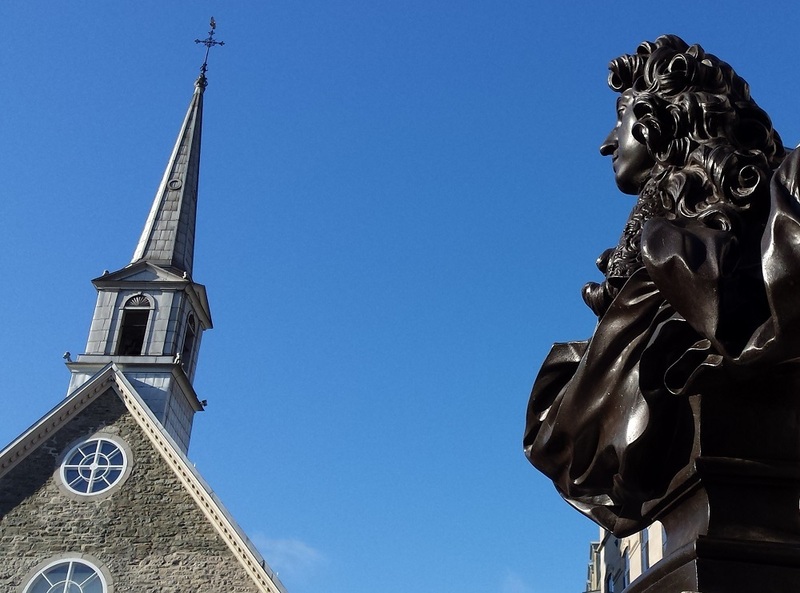 Bernini’s artistry shines most brilliantly in the morning sun of a Québec summer. Enjoy your posts. Keep them coming. Remember fondly your excellent and informative tour of Quebec from our cruise. Would do it again in a heartbeat if ever there again. Thank you Neal. Really enjoy your posts. This was very Interesting! Thank you for your posts! Thank you for sharing your love and knowledge of this beautiful city. Always enjoy your posts. Merci! Thanks, Neil, for sharing your wealth of knowledge and keeping Quebec alive for us. Great post Neil! You’re quite a story-teller! Keep up the great work! Thank you for your continued history lessons…enjoy everyone of them. We enjoy your letters so much as it reminds us of our wonderful visit to Quebec and meeting you. Our knowledge of Quebec increase with every letter. Thank you so much. A long time I read you, probably because the high touristic season is currently ongoing and keeps you very busy. Very interesting story about this sculptor, that I didn’t know actually, and the “The Sun King” of France. Thanks again. Our Holland America cruise in late April and early May was mostly cold and gray and wet, but your walking tour was a ray of sunshine on our one bright sunshiny day–the best day, you said, that Canada had had since the previous October. We were lucky with the weather in Quebec and lucky to have you as our tour guide. Now we are back in hot, sunny Florida and wishing we were back in cool Canada. Great posts although I rarely sent comments, I enjoy reading them every time. Thank you Neil. Enjoyed the article. Still remember what a great tour guide you were when we were there. Some people have a gift for sharing history and breathing life into it. We always enjoy your posts and will return to your lovely city soon! Thank you so much for an excellent tour of Quebec City! It far exceeded all expectations, and we can’t wait to come back! As always, an interesting article. I would just like to mention that some years ago we visited Versailles. However, it was Easter, the Palace doors were closed (the grounds were very busy with locals as the gardens were open – and the Easter restrictions not published). So it might be worth warning your readers not to embark on an expensive waste of money over an Easter period. Je suis toujours content et intéressé de lire ton Quebec and moi! Une étude approfondie en quelques lignes intelligemment écrite, le “lifting face de Louis par Benini, ” comme quoi un artiste-sculpteur peut améliorer le sort d’un Roi sans être médecin – esthéticien : tout droit ” Sorti de la cuisse de Jupiter ” . Merci pour la magnifique photo, tu as vraiment du nez entre les yeux du monde historique de Québec, la Cour te remerciera pour ta participation à la gloire de Notre-Dame des Victoires, au pain béni des colonies, voir la Délibération du Conseil Souverain du 3 janvier 1670. Tradition qui se perpétue je crois nommé “les petits pains” de Ste Geneviève.